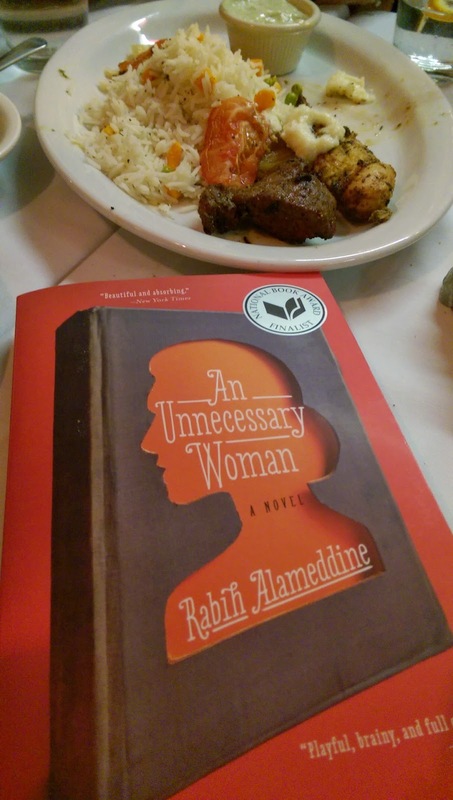 Tonight my Arab Authors Book Club met to discuss An Unnecessary Woman by Lebanese American author Ribih Alameddine. This book was a 2014 National Book Critics Circle Award finalist. Rather then met at our usual location of someone’s home, this month we met at restaurant Gorgeous George. 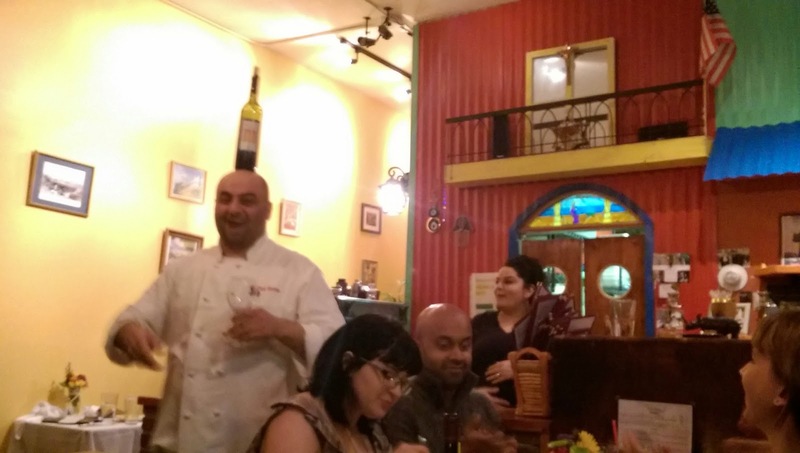 The owners were very hospitable and the food was enticing. Since it was a Thursday night, the place was packed and our table of eight were treated like royalty. The entire place only holds about 15 people tops, so we were very fortunate to get reservations. As more people came in and out, I realized looking around that everyone was being treated like royalty. It felt warm and friendly and I love how bright and colorful the walls were designed. As a mother of three, I felt for the owner’s wife, who is currently 6 months pregnant. At one point, our table was low on water, so we tried to help by taking the water jug from her to hand it around. She would have none of it, true Arab that she is. Insisting on taking back the jug and serving each of us with fresh water, with blood orange slices, cucumber slices, mint and other delicious flavors floating in the jug. We ordered the Nazareth Appetizers and a few Georges Combo Platters to share. We had so much food left over that a number of us were able to take home leftovers. I must say one of my favorite courses was the salad. The dressing was so good and I can’t wait to have it again on a return visit. Too sad for me there were no leftovers of that. Right after ordering, we got down to business and discussed the highlights and what we didn’t like about An Unnecessary Woman. One member thought it was interesting that a male author decided to write as a woman, but she had a hard time relating to her character. But the analogy between Beirut and Elizabeth Taylor really spoke to another member, who felt that writing in a female voice did not hinder the piece. Our group seemed to be split in half with the author’s use of quotes from other books. Some felt it took away from the story and seemed rather pompous, while a few thought that it added to the story and our protagonist’s love of books and reading. Another part of the book that seemed to really resonate for a number of us was the use of music in the story line. Finally, we all enjoyed discussing how the women in the story took care of each other. Even protecting each other in times of war, despite not liking each other at times of peace. And some of us even shared stories of how the old building in the story was similar to other Middle East buildings we grew up in, where the women sometimes helped each other hid affairs and secrets. I wish we had made room for dessert, but alas, we couldn’t even finish the dinner, so we picked our book for next time and prepared to say our goodbyes. Seventy-two-year-old Beirut native Aaliya Sobhi, living a solitary life, has always felt herself unnecessary. The father who adored her died young, and her remarried mother focused attention on Aaliya’s half brothers, leaving her to describe herself as “my family’s appendix, its unnecessary appendage,” an attitude reinforced by her Lebanese culture. Divorced at 20 after a negligible marriage, she lived alone and began her life’s work of translating the novels she most loved into Arabic from other translations, then simply storing them, unread, in her apartment. Sustained by her “blind lust for the written word” and surrounded by piles of books, she anticipates beginning a new translation project each year until disaster appears to upend her life. But these are just the bare bones of a plot. The richness here is in Aaliya’s first-person narration, which veers from moments in her life to literature to the wars that have wracked her beloved native city during her lifetime. Studded with quotations and succinct observations, this remarkable novel by Alameddine (The Hakawati, 2008) is a paean to fiction, poetry, and female friendship. Dip into it, make a reading list from it, or simply bask in its sharp, smart prose.